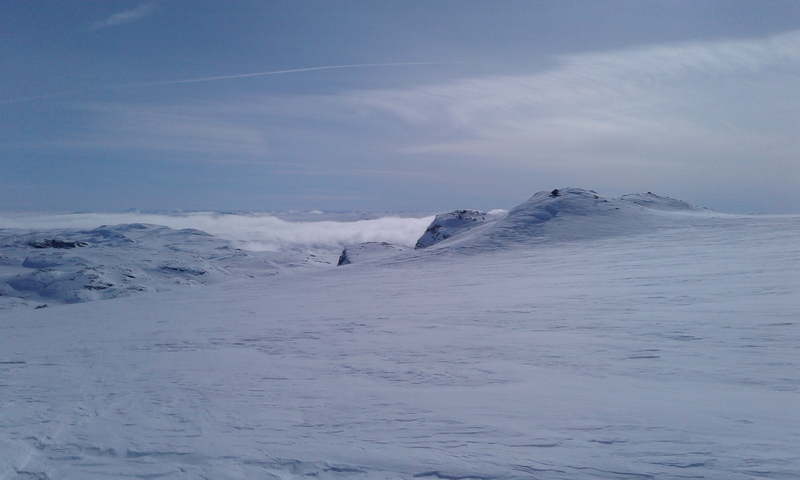 Elevation 900-1800 m. Temperature -1°...-20°C, normally -5°...-10°C. 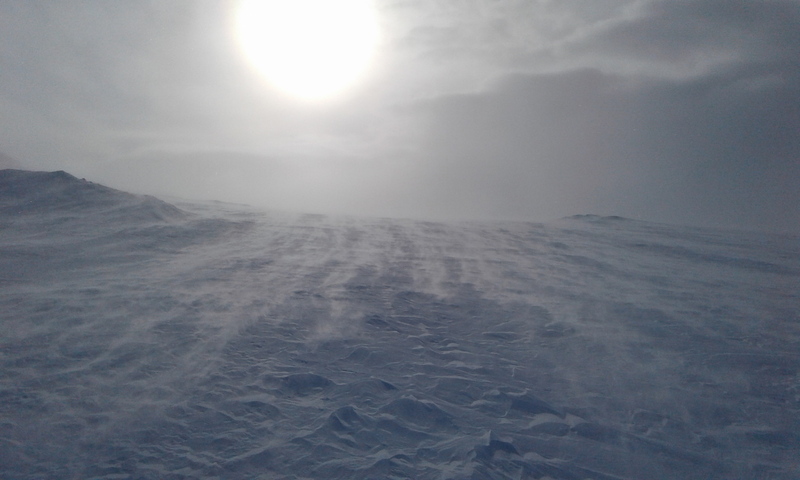 Wind 5-15 m/s, two days of snow, occasional whiteouts, but no real storms. 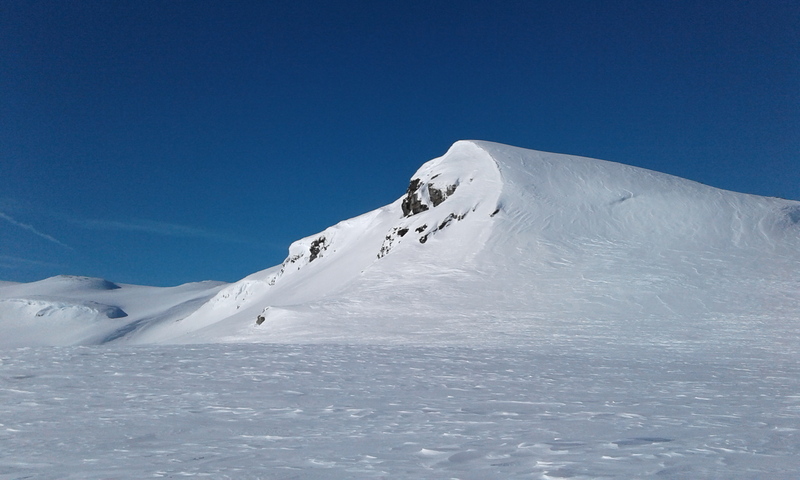 Snow condition: powder the first two days, then wind-drift and increasingly hard, icy crust, with some nearly bare patches on exposed slopes. Trail: an extensive system of winter trails marked with dyed twigs approximately every 25-50 m. Most routes have snowmobile tracks, but in windy weather with drifting snow there may be no tracks at all. Few or no trails off the marked winter routes. 7 kg base weight + 7 kg of food and fuel. 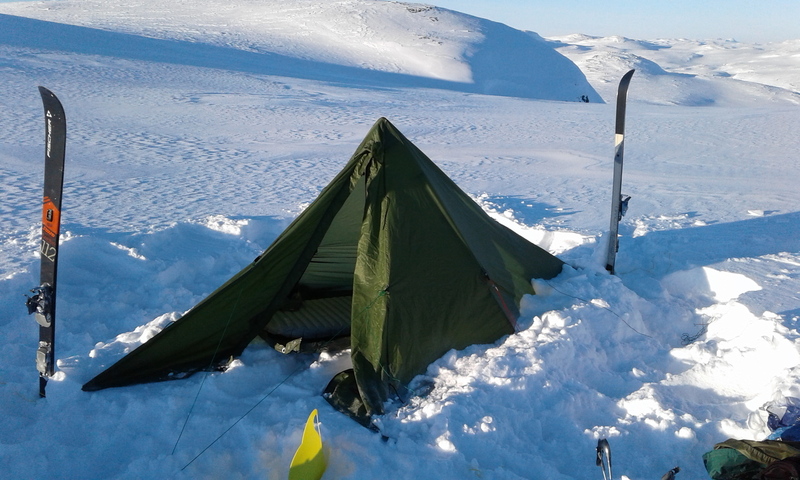 After last year's (mis)adventures along Kungsleden in Sweden I invested in sturdy backcountry skiing equipment. Skis: Fischer S-bound 112 mm with Easy Skins. Bindings: Voile Traverse (3-pin), with cables and climbing wires. Boots: Scott Excursion plastic telemark boots. Apart from some highly uncomfortable pressure points in the brand-new and untried boots, this set worked like a charm. The S-bounds float well in deep powder, provide a strong grip on an icy crust, and above all they turn well enough to have some serious fun on the descents. 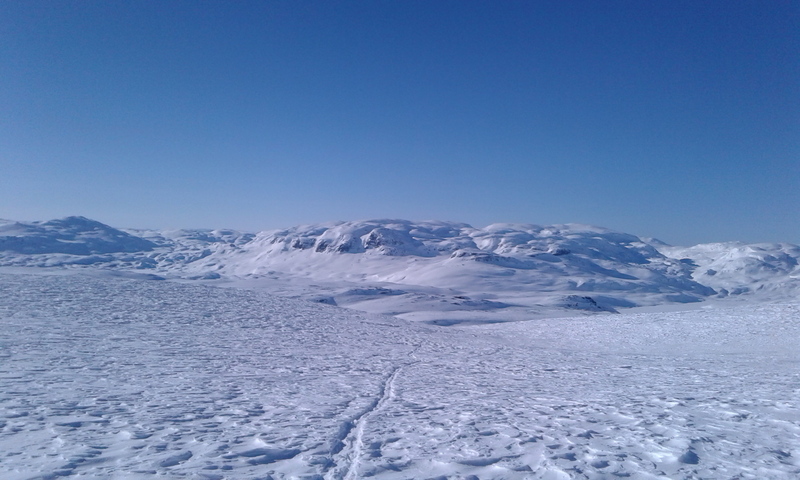 The climbing wires and particularly skins proved extremely helpful on the ascents, such as the long and steep climb to the top of Hardangervidda's main glacier. 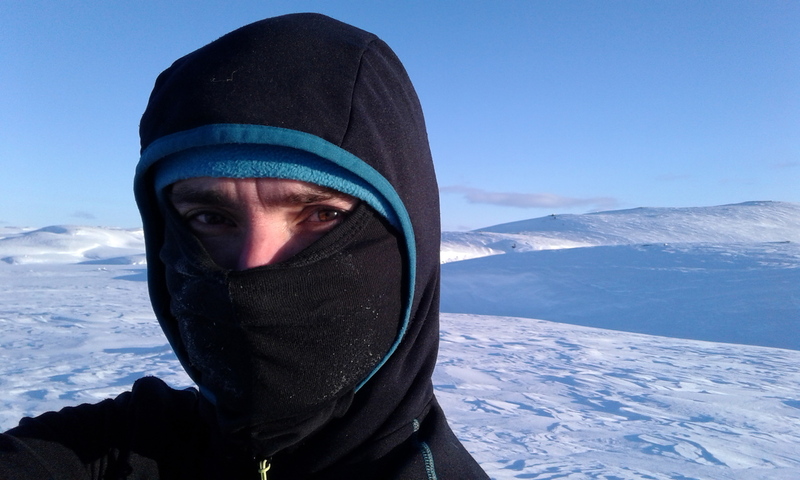 The weight of all this heavy artillery is not really justified on a groomed trail (such as most of Kungsleden), but it is a must on this exposed plateau, which lies entirely above the treeline. If the goal is not only to get from A to B, but to take a few turns as well, broader and sturdier skis become even more imperative. 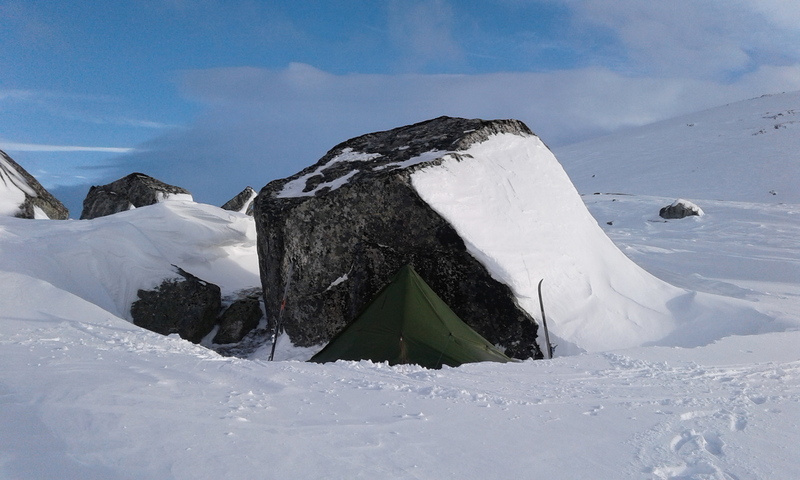 For this hike I also switched from a flat tarp to a more enclosed and storm-worthy shelter, namely a sylnylon mid from legkoves.com (~700 g with snow anchors and guylines), which I pitched with trekking poles. 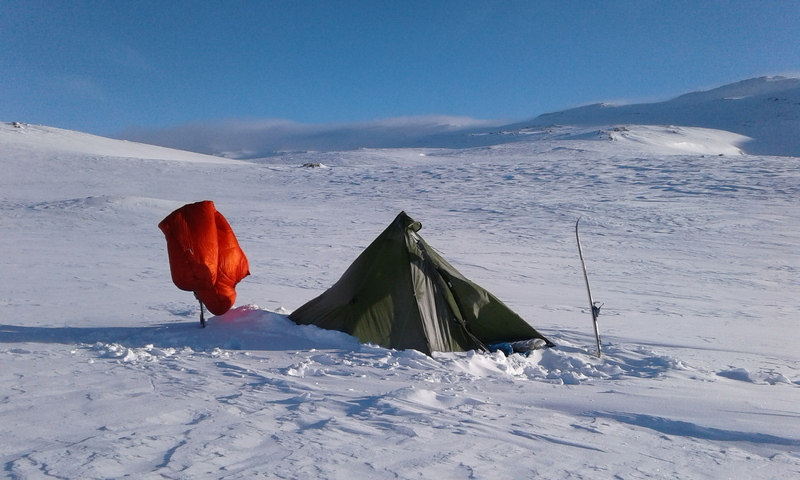 It worked well and withstood some serious winds when tied out to the skis and several DIY snow parachutes. 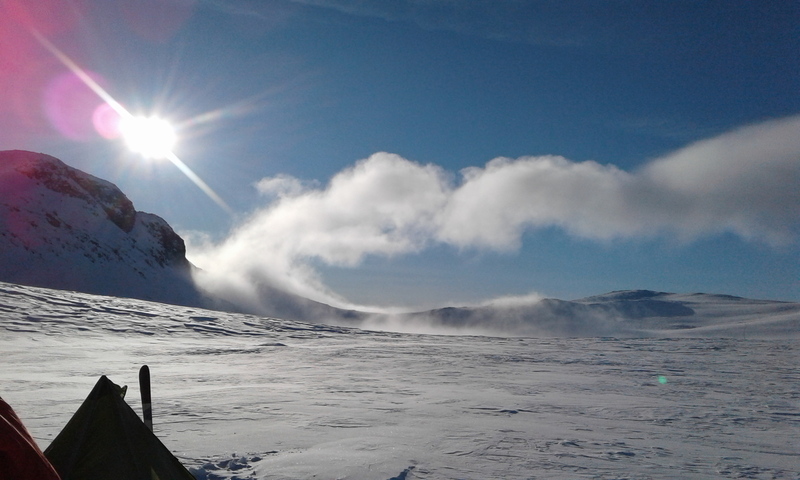 The main drawback was the tradeoff between venting and keeping out the drifting snow. 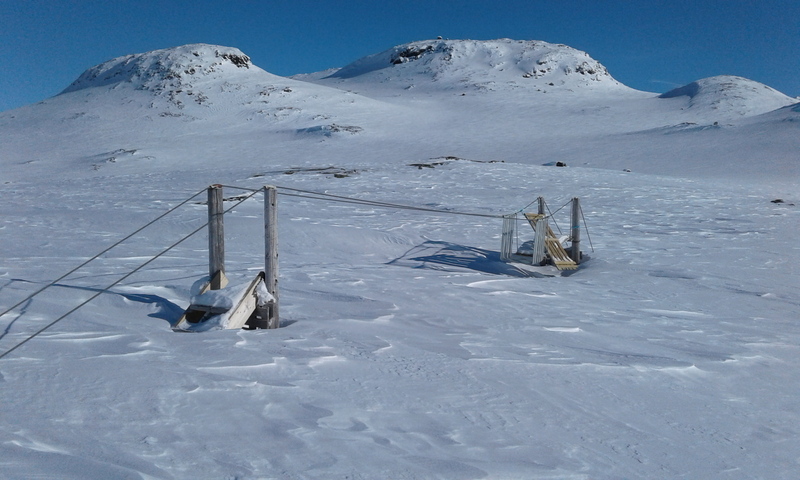 There are many tourist huts in Hardangervidda, some of which are staffed and provide some supplies. They are expensive to stay in, however (in the unmanned huts guests are expected to enter their names in the log book and transfer the payment after the trip). 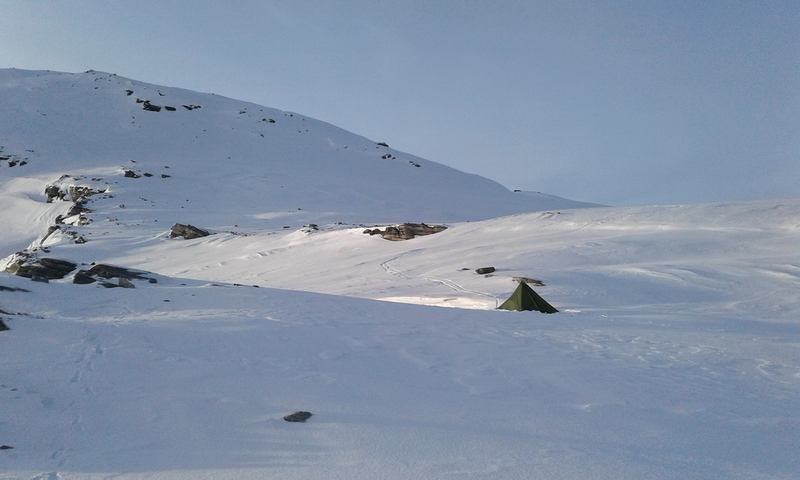 As usual, I gave the huts a wide berth and camped every night. Water: I did not encounter any liquid water on the entire trip, apart from the one time when I got some from an unmanned tourist hut. I melted snow for drinking (~1.5 L/day) as well as for cooking (another 1.5 L/day). Defying the conventional wisdom, I also ate snow throughout the day. Taking a little bit at a time keeps the throat from cooling down too much, but over the day it provides a considerable amount of liquid and helps to save fuel (I used ~400 g of propane/isobutane mix on the entire trip). 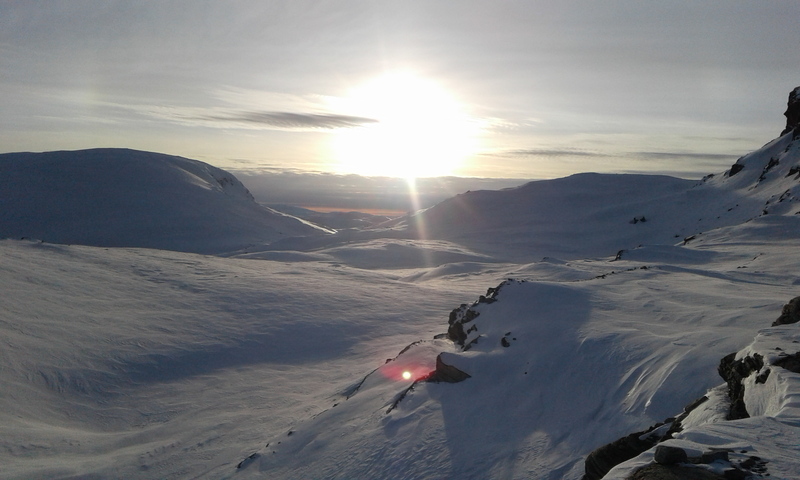 I still had a couple of hours before nightfall the day I started, but it was just enough time to make my first tentative steps on the previously untested skis in previously untried boots (there had been no snow at all in southern Sweden, where I'm now living). 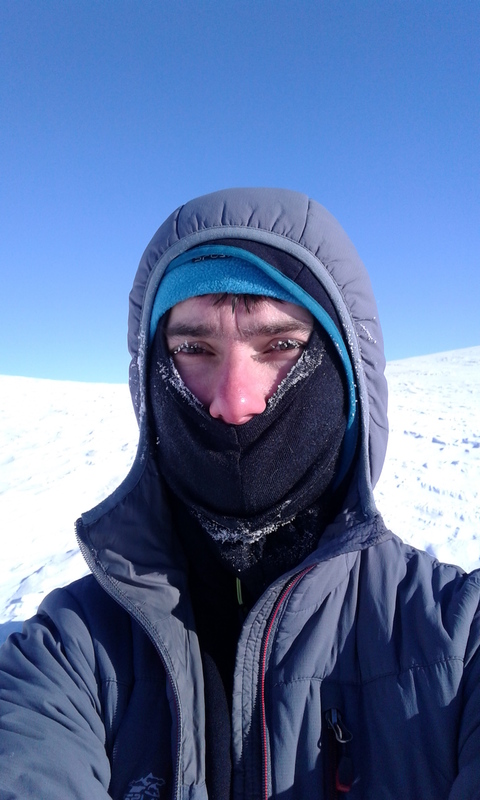 The brand-new and unfamiliar pyramid tarp also proved tricky to pitch for the first time in the twilight on open slopes way above timber line, at -15°C with 10 m/s wind. 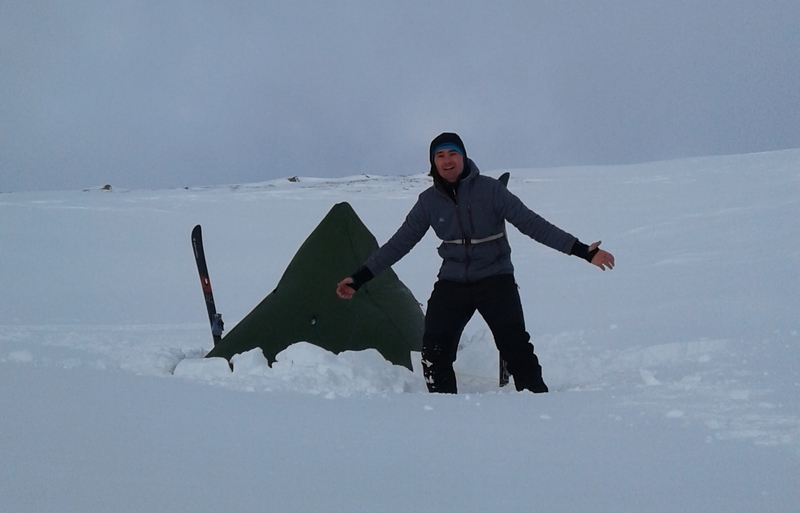 A corner guyline got torn by the gale some time during the night (beware of the sharp steel edges on the skis if you tie your tent to them!). After securing the tarp provisionally, I let it cave in by removing the supporting trekking poles, so as to prevent further damage. The rest of the night was therefore spent under the wildly flapping tarp, which is not conducive to sound sleeping, but at least it blocked the worst of the wind and the drifting snow. Following this inauspicious debut, I had two days of bright, cold, moderately windy, but sunny weather, which in retrospect were the best conditions on this hike. You just never know what's coming, do you? The benign weather couldn't last, I knew that. When I was leaving home, the forecast promised that the first two days would be windy and cold, but the rest of the week would be cloudy and calm. Well, it wasn't: the wind actually picked up. 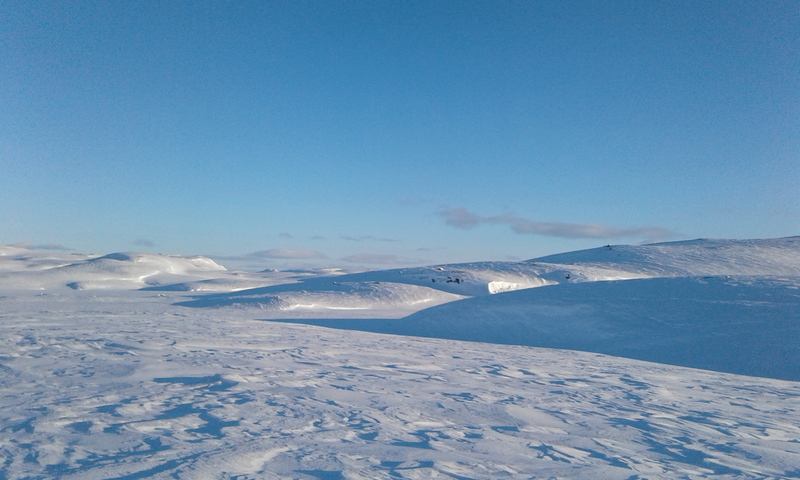 Drifting snow is primarily a hassle because it limits the visibility, not to mention that taking breaks becomes problematic, unless you find a sheltered valley or a really big boulder that can block some of the wind. 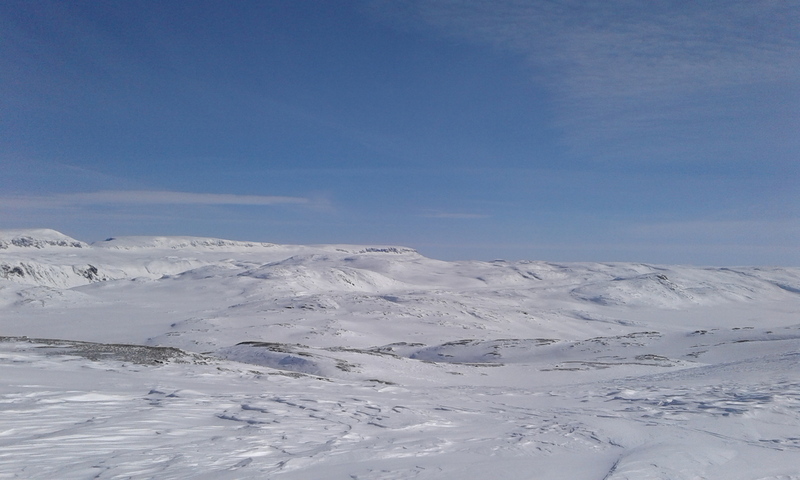 Here is the view near Litlos, which lies fairly low at ~1200 m. Once higher up on the way north past Hårteigen, for the rest of the day I was in and out of a cloud, so the visibility dropped to a few hundred meters. The next morning (Day 4) I turned north-east towards Dyranut and covered a lot of ground thanks to relatively calm conditions and the extremely hard crust that the gale of Day 3 had created. 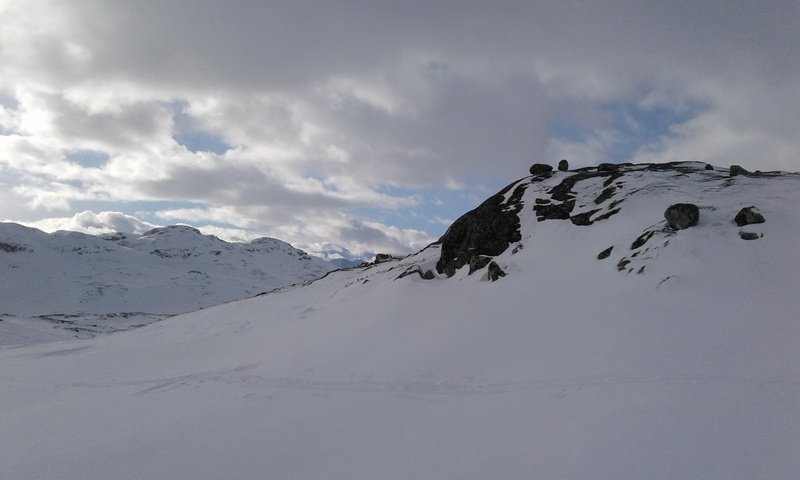 In fact, on some slopes there was hardly any snow left, and I even walked on foot for half an hour or so in order to spare my skis. The zastrugi were worthy of Antarctica, and I'm sure ordinary cross-country skis would have been destroyed a hundred times over. The hard crust was also tricky on descents, but a lot faster than powder and certainly much better for covering distances. After another stormy night south of Dyranut, I spent most of Day 5 in a dense snowcloud with the worst visibility on the entire trip. 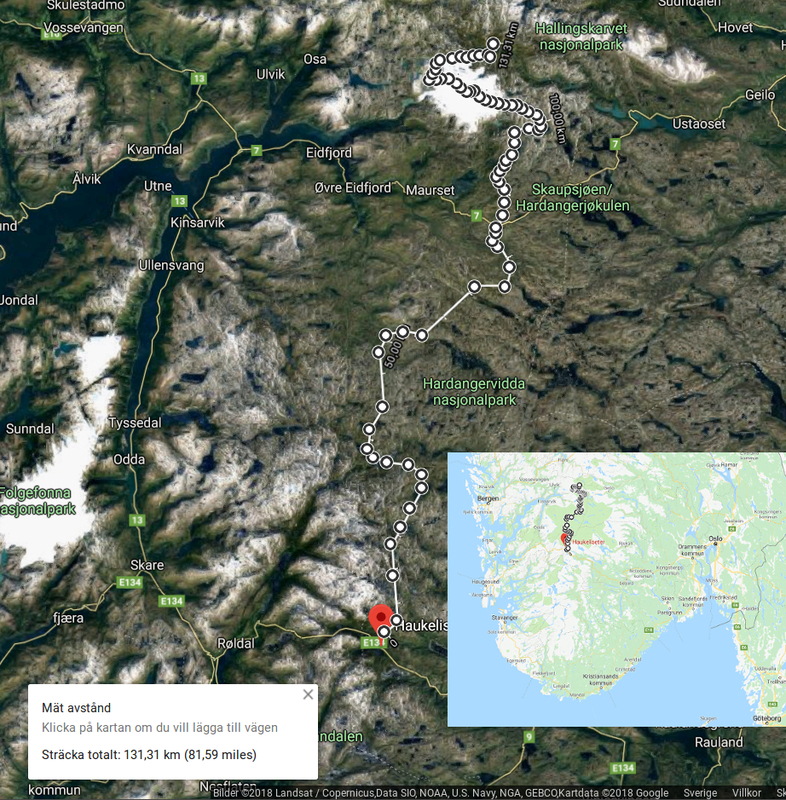 The route north was pretty straightforward and mostly flat until the foothills of the mighty glacier of Hardangerjokulen. 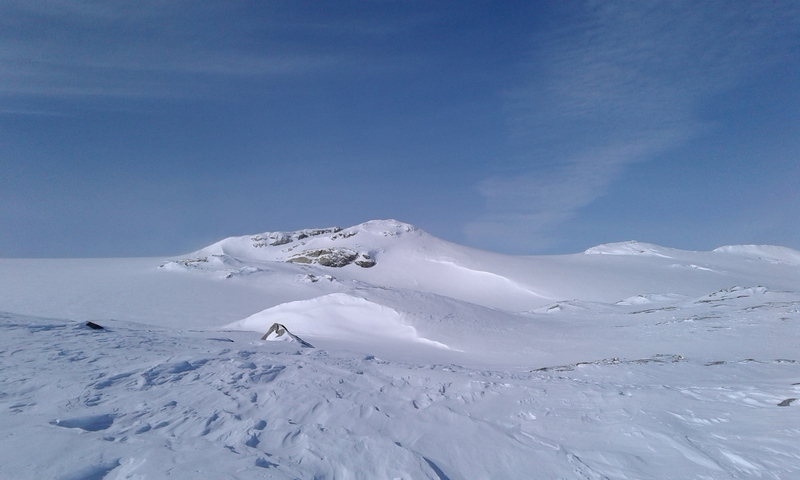 However, I set my sights higher and decided to find a way up the glacier from the east, planning to join the marked route at the top. 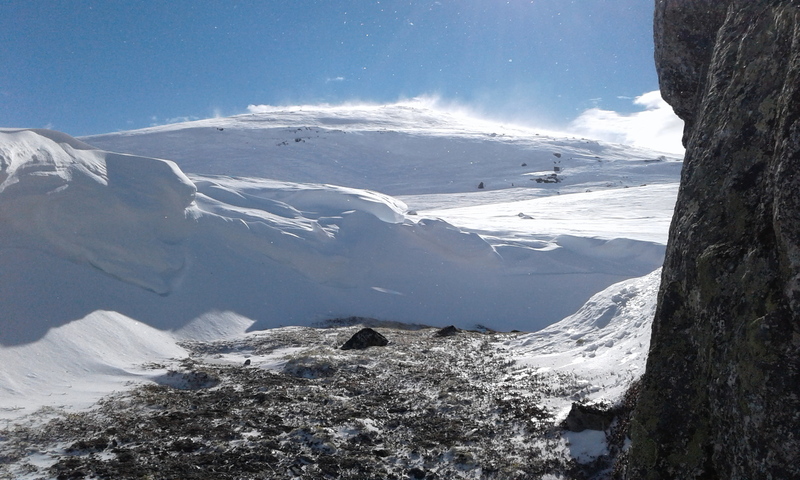 The weather being windy but sunny, this proved quite easy thanks to good visibility and climbing skins. These guys make a huge difference on a long ascent, particularly if there is a bit of a crust (less effective in powder). Despite a frisk headwind, I basically went straight up this glacier - 400 vertical meters - at nearly the same speed as on flats when breaking trail. Amazing. 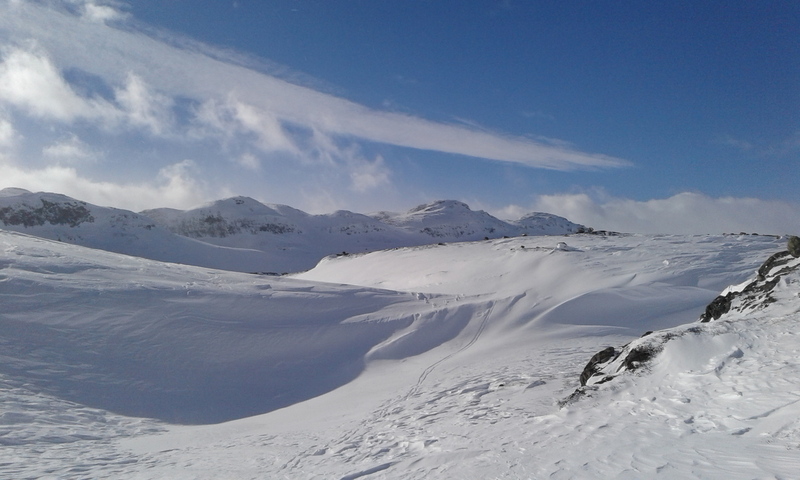 I was not due back in Oslo yet, and Finse was just a few kilometers away, so I spent most of the remaining time practicing telemark turns on the surrounding slopes. I had never skied on anything other than narrow cross-country skis before, and the sensation of actually being able to turn was a huge eye-opener. The weather turned foul, though, and my feet were increasingly painful from the pressure points in the boots, so I didn't overdo it. 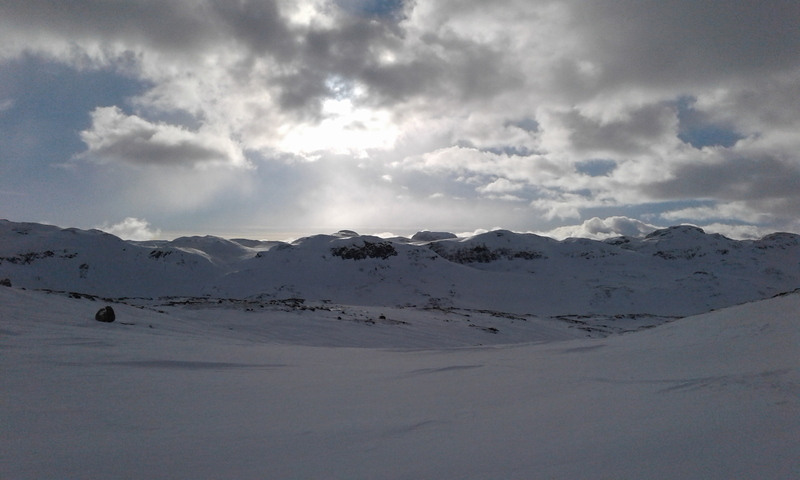 The last kilometer to Finse was rough enough to help me really appreciate the shelter of the waiting hall at the train station, not to mention the first access to running water since the trip began. And that's about it! Andrey Anikin, 2018. No copyright on any content.